I think they look like little rats, and taste like mashed potatoes. Is that a ringing endorsement for you? 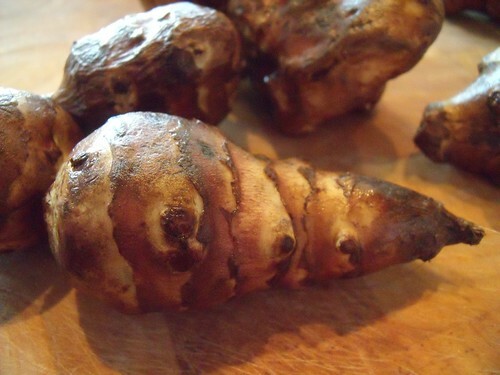 But seriously, I am super excited every year when these tubers turn up at the farmers’ market: Jerusalem Artichokes (also known as sunchokes). Interestingly enough, they have nothing to do with either Jerusalem or artichokes. They are from the sunflower family, and even grow yellow flowers above ground! They make a rockin’ soup, but I can’t yet move past the simplest preparation method: roasting. I strongly believe that everyone should be able to roast veggies. Toss them with olive oil, and throw them in a hot oven. Let the heat turn them to magical deliciousness. Anything that caramelizes is extra tasty. And that’s why I like leaving the skins on my roasted Jerusalem artichokes — the roasted skins have a great crispy texture that contrasts so nicely with the ever-so-slightly nutty & grassy taste of the smooth insides. I enjoyed these yesterday with my Kasha (Buckwheat) with Collard Greens, the deep earthy/grassy/nutty tastes complemented each other really well. 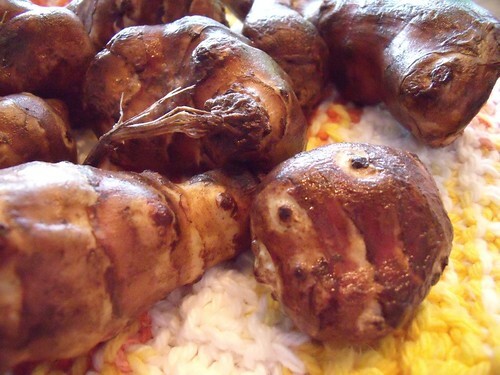 In a roasting dish lined with aluminum foil, toss Jerusalem artichokes with olive oil, salt & pepper. Roast at 400F for around 30 minutes, or until the insides have gone completely fork-tender, like mashed potatoes. I like to stab them in their centres with a fork, and bite off chunks with my teeth. The boyfriend tends to slice them open with a knife and eat out the insides. Have at it which ever way appeals to you. And enjoy! Another feared ingredient – why am I such a set-in-my-ways nanna? Maybe it’s the E.T factor!